Contacts are considered to be a part of the phone’s software which is extremely important, and for the same reason users use different services to make sure that this data of the phone remains safe and secure. It is also to be noted that the best software is the one which is not cloud based. Due to the fact that the cloud based software programs can undergo many issues and problems, including data theft and manipulation of any kind. Therefore, the need of the hour to make sure that the contacts of the iPhone remain safe and secure all the time is Gmail as it comes to online reputed services. Backed by the power of Google, Gmail has been regarded as the best and the securest service of all time. It not only stores the contacts but also ensures that they remain in such an environment which is safe, secure and risk free. 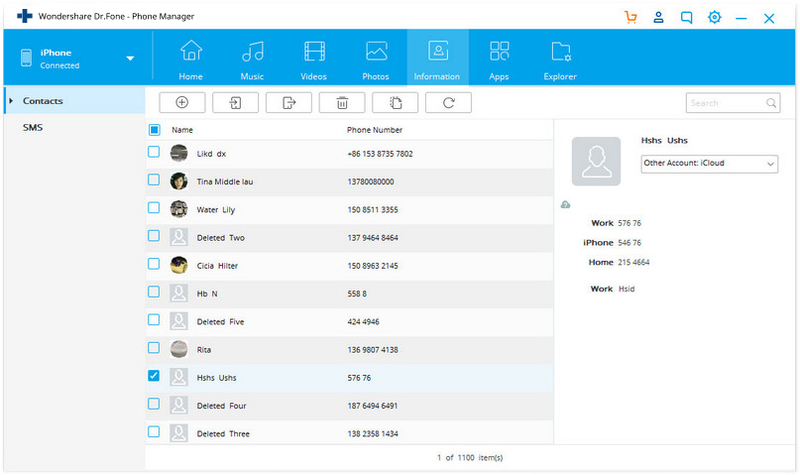 It also makes necessary changes to the contacts to make sure that the person saving them faces no issue in finding any particular item. 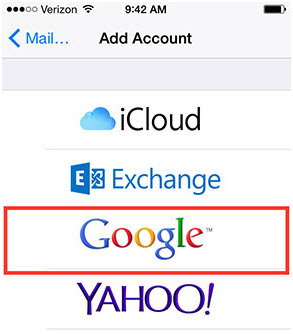 Transferring iPhone contacts to Google is regularly used by people to keep their contacts safe. So Some of the techniques and their detailed usage have been mentioned in this tutorial. 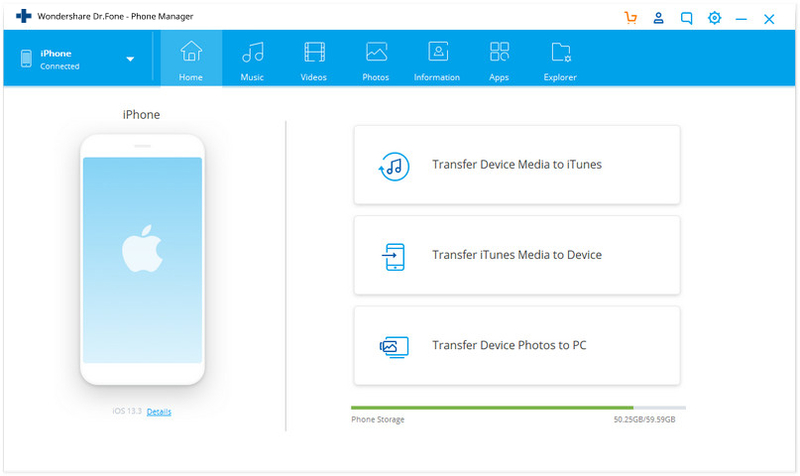 There are several advantages of using dr.fone - Transfer (iOS) and some of them are as follows. Step 1. Download and install dr.fone, then connect your iPhone to PC and choose Transfer from the main interface. 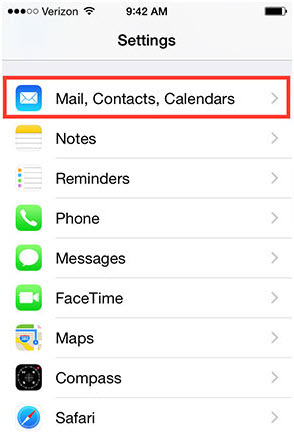 So that you can sync your iPhone contacts. Step 2. Tap Information on the top panel, and it will show all the contacts on all programs. Step 3. Then you needs to select the contacts one by one to ensure that all those are chosen which require export and click Export on the top of the windows. 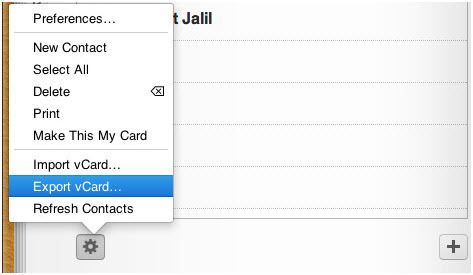 From the drop down list, select "Export" > "to vCard File". Then a pop-up window comes out to browser the destination folder to save the selected contacts on your computer. 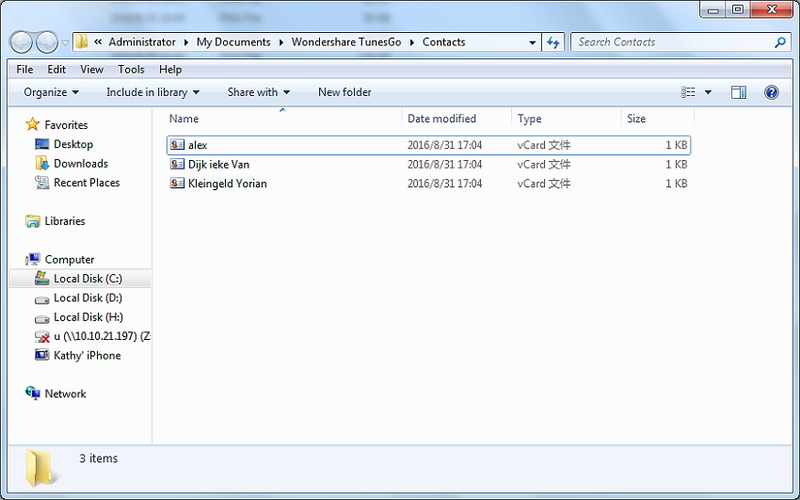 After the contacts have been exported to computer, click on Open Folder on the popup window and you will find the contacts file on the local storage. Step 4. 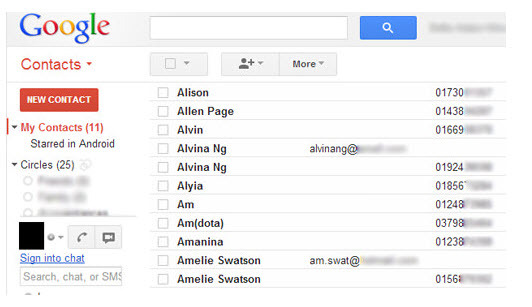 After you succeed saving the file on your computer, log into Gmail with your account, then click Gmail > Contacts at the top-left corner. You will go to the Contact page of Gmail. Step 5. Click Import Contacts, a window will pop up, click Choose File to add the saved v-Card file and then click Import button to load the contacts. Step 6.The selected contacts will be imported to Gmial successfully as below. 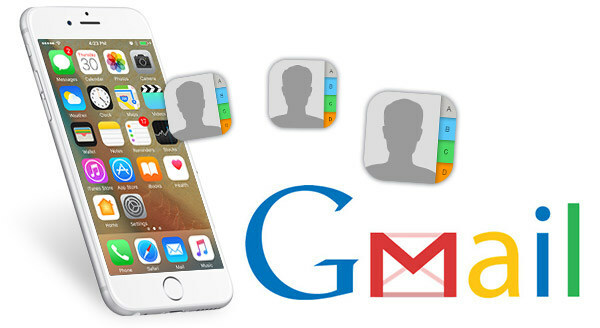 It is a simple and one-step process which makes sure that the contacts are transferred to the Gmail without the interference of any external application and all the work is done on iPhone alone. The process is mentioned as below. Step 1. 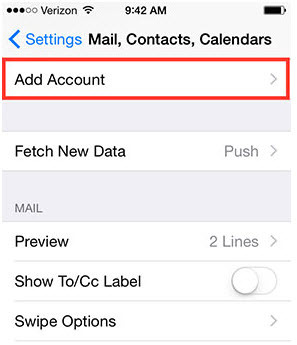 The user needs to tap Settings > "Mail, Contacts, Calendars" to begin the process correctly when it comes to direct syncing. Step 2. On the next screen, the user needs to tap "Add Account" to make sure that the email accounts supported by the device pop up. Step 3. Google account is to be selected from the page that comes in next. Step 4. The user just has to make sure that the contacts are turned on, and when this process has been completed and the Google account has been added heading back to the contacts, screen will show that the syncing has begun automatically. iTunes is a program that can be regarded as air for the iPhone as most of its functionalities depend upon this program. In order to transfer contacts through the iTunes, the process is mentioned as below. i.	Connect iPhone to the computer through a USB cable to start the process. ii.Launch the iTunes software so that it can detect the device with ease. iii. 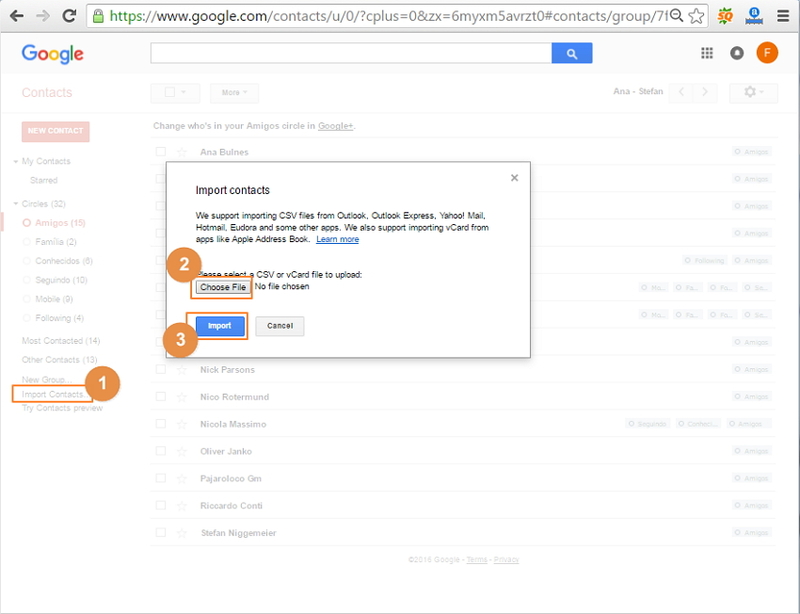 Under the Info tab, select the option of "Sync Contacts with Google Contacts". iv. Enter the Gmail username and the password as soon as the prompt comes out to proceed further. v.	For further clarification, the user needs to visit www.gmail.com, then Gmail >Contacts. vi. 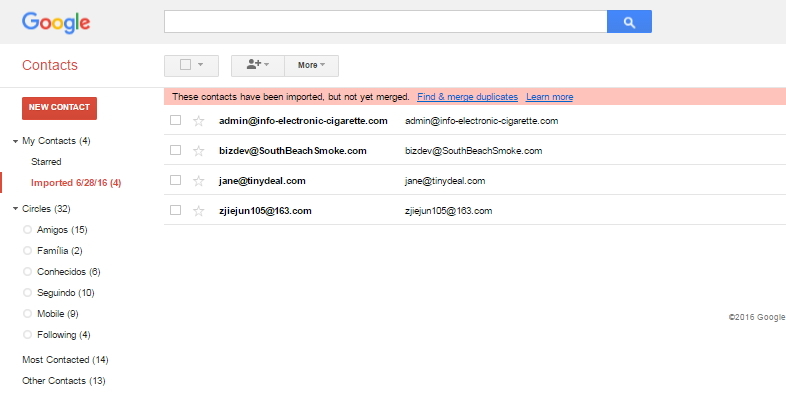 All the contacts are imported to Gmail directly. iCloud is also considered to be one of the best programs that makes it possible for the users to transfer not only contacts but also the other media files that have been stored on the iPhone. 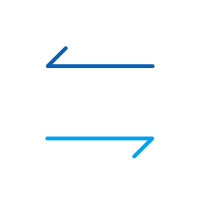 To transfer the contacts in particular, the user never needs any complex method or tools as everything is there by default to support the phenomenon. Following is the process in this regard. i. 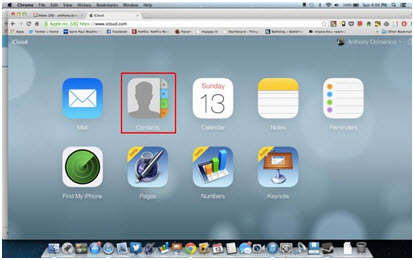 You need to go to the iCloud website and enter the desired details. ii. Click the Contacts icon. iii. 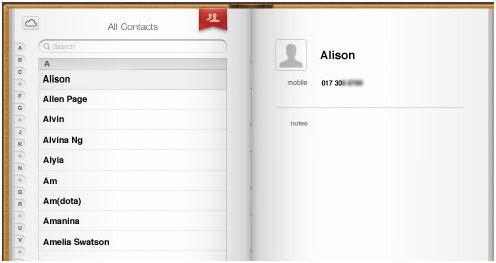 All the contacts will show up which have been synced with the iCloud. iv. Press "Ctrl + A" so that all the contacts are selected, then press the cod button at the bottom left corner and from the drop-down list, select the option of “Export vCard” to export the vcard file to your computer. v.	Then, you can import the saved vcard file to Gmail, for the details, you can refer to the Part 2's Step 4-6.
dr.fone - Transfer (iOS) could also help you sync outlook contacts to iPhone, manage iPhone contacts or backup iPhone contacts to PC. Simply download and have a try. Have some CDs and want to transfer songs in CD to your iPhone? This article tells you 3 ways to transfer songs from CD to iPhone easily. Most people wonder how to transfer text messages from android to iphone when they bought a brand new iphone. Don't worry. Read on to find the best solution. You have an ipad and iphone. What if you need to transfer photos between them? Find here solutions on how to transfer photos from ipad to iphone. If you aren't sure how to transfer apps from iPhone to iPhone keep reading this article will assist you with the top 3 ways to transfer apps to new iPhone.